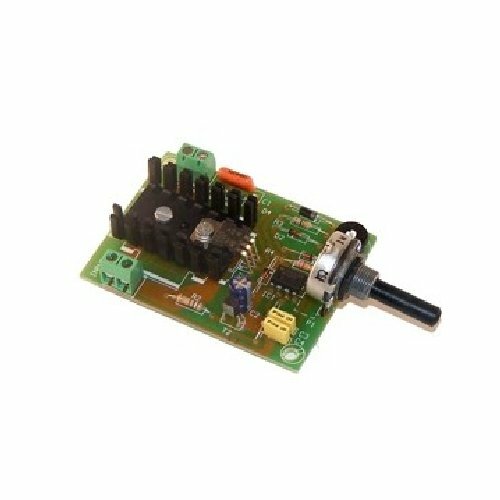 This 1.5 Amp DC motor speed controller allow you to adjust the speed of single-phase, universal DC motors with 6V-16Vdc supply. Speed adjustment is controlled using a PWM Triac output and a potentiometer mounted on the board. Models for 1.5A, 3A and 6A operating loads are available in this range. PRODUCT SELECTION NOTES: These modules can be used to control other resistive loads like DC lighting but they are NOT suitable for use with inductive loads like neon's, halogen lamps, transformers, etc,.. The motor controller should have an output load capacity at least 25% above the motors peak power requirement. Please do NOT rely on motor rating plates for power consumption figures as they often quote average not peak power. You should verify the actual peak power at start-up and under full load before selecting an appropriate size motor controller.